This stylish and enchanting Italian restaurant has a beautiful terrace, and is just minutes away from Lord's Cricket Ground. The glass-walled conservatory area is lit by thick white candles and provides a romantic ambience to enjoy a classy meal. The fabric covered chairs and bright white damask tablecloths make this one of North London's classiest restaurants. For a little more privacy there is a downstairs dinning area with a lovely warm atmosphere. Head Chef Andrea Vercelli is well known for her innovative Italian cooking and Rosmarino has won the Time Out Best Local Restaurant award. Her interpretation of classic regional Italian cooking is uniquely inspiring. Service is charming, efficient and charismatic, they'll make you feel utterly at home. There is a professional sommelier who can introduce you to 320 wines and help you choose the perfect accompaniment for your meal. When the weather is fine enough, you can dine out on the patio and watch the world pass on by. There is a large bar area where you can enjoy a couple of drinks before your meal. There is also a private dinning room, which can accommodate groups of up to 20. 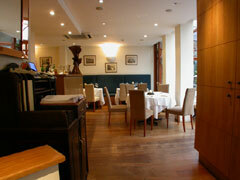 The restaurant is available for exclusive hire on request. A wonderful place for a summer wedding reception. The menu consists of a nice line of contemporary Italian cooking. Starters of warm cuttlefish and mussel salad or scallops are quite spectacular. The bread basket is an assortment of breads covering about 3 or 4 regions of Italy, combined with a generous portion of Tuscan olive oil. Follow on with pasta or meat dishes. Fish lovers are in for a treat with the unique Mediterranean fish stew. The wine list offers a guided tour of some of the very best of Italy�s vineyards and there is a touch of freshness in the dessert menu.